At least from these three cities in Bavaria there is a plan to go with convoys of cars to Hamburg. You can have soon more information here or you just contact buss@welcome-united.org to get in touch with people travelling from these cities if you want to join them. From Berlin a joint journey with several buses is planned. From Berlin a joint journey by train is planned. 1-2 buses will depart in Bad Belzig and people from different places and lagers in the area (Brück u.a.). There will most likely be a bus from Eisenhüttenstadt. If you live in the state of Brandenburg and want to go with a bus or a group and if you have any questions about tickets and travel you can contact Carla by phone or Whatsap: +4915755290998. Joint travel with a train using the Niedersachsen-Ticket. For free if you cannot pay anything. From Hanau there will be 2 busses to Hamburg. We will sleep Saturday night in Hamburg and start at 11am the next morning our trip back to Hanau. At 7pm (19:00 Uhr) Sunday evening we should be latest back in Hanau then. From now on there will be tickets for the busses. Every Monday you can get themj in Metzgerstr.8 during the counselling (4pm till 7pm). The ticket costs 10 Euro. People who are working should pay more, 40 Euro if possible this is the price that somehow covers the costs. From Kassel you can get to the parade by bus or train. Primarily refugees and people with low budget are invited to go by bus. Everyone who can imagine to go by train should rather choose this way of travelling (we will jointly go by train). In case there will be places left in the bus, remaining tickets will be given to people who decided for the train option (we will send an email). Train: All those who go by train meet 6:15 am at Kassel main station (Hbf). The train leaves 6:36 am. We go by group ticket (about 13,60 € per person). The time of return can be decided upon by each group. Bus: We meet at 7:45 am at bus parking space Steinweg at Naturkundemuseum. The bus leaves 8 am sharp! Solidary ticket: 30 €, medium ticket: 20 €, low budget ticket: 5-10 €. Return: From Hamburg the bus leaves again at 6 pm. You can also buy a “Make it happen”-ticket to financially enable travelling for another person. Please let us know how you want to travel (contact: kassel@solidarity-city.eu ). Friends from Mainz can also travel with the bus from Wiesbaden. Information soon here or via the contact address. At least 3 buses will travel from Lüneburg to Hamburg. From Osnabrück, there will be a joint journey by train. More information soon and at this point. There will be a bus from the camp in Horst: 29.9. at 9:30am in front of the gate of the camp. Nostorfer Straße 1, 19258 Nostorf-Horst, Mecklenburg-Vorpommern. The bus will go back to Horst at 17:30Uhr (5:30pm) at Landungsbrücken. There will be a meeting point to go together by train to Hamburg in Bielefeld. We meet at 7:45 in front of the main entrance of main-station (Hauptbahnhof) in Bielefeld. The train (RE6) leaves 7:59 at track 2. Contact: antiraag@riseup.net. 2 busses will go from Cologne to Hamburg. If you have any questions you can contact WCUcologne@gmx.de via email. Tickets will be sold in Trash Chic und in SSK Salierring. We will travel back the same day from Landungsbrücken in Hamburg in the evening. Meetingpoint for Wendland and Altmark to go by train to Hamburg is at 9.15am at the trainstation Salzwedel. Two busses will leave already on Friday, 28th of September, so one day before the parade on the early afternoon from Jena and Erfurt. 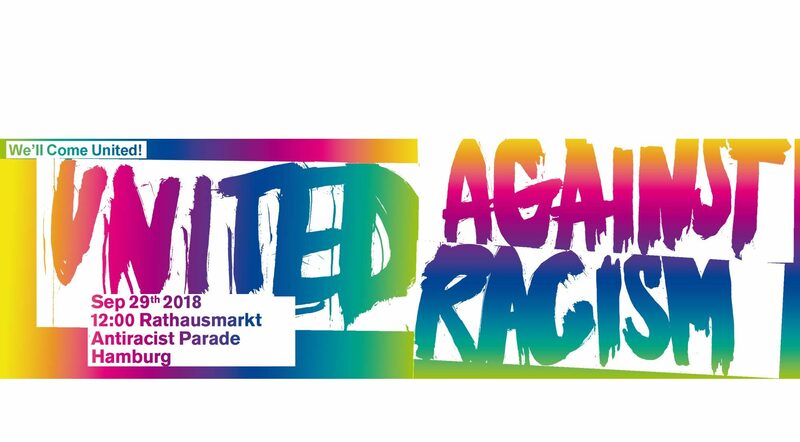 On Saturday we will take part in the parade of We’ll Come United. After the end of the parade the busses will go back to Jena and Erfurt. We will be back late in the night on 29th of September. Please tell us in advance if you need sleeping-places in Jena or Erfurt. 1 Bus will go from Zurich on Thursday to Hamburg (during the night from Thursday to Friday) and will go back on Sunday noon. The ticket costs 150,- CHF per person.